I’m a photographer and sales representative for a press company. 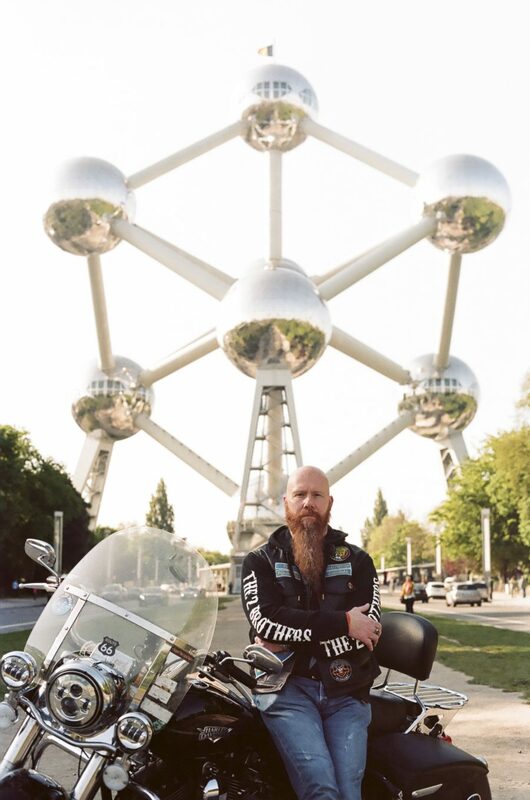 I also founded the Brusseleirs Bikers, a club for Harley-Davidson lovers living in Brussels. I always look for the best in any experience, which have been countless both personally and professionally. Methodical and structured – I see a project through till end without ever giving up. Two things: my two kids Esteban & Tehrri, but also BXLR22 “Brusseleirs Bikers”, a project I created together with my brother. I’d suggest Brasserie Le Central in Jette. It’s a fantastic mix between traditional Brussels and Belgian cuisine in an old Brussels brewery, with all types of local clients. I will take them out with other members from Brusseleirs Bikers for a trip on our Harleys, to let them see and discover Brussels in another way. Dallas, only dikkeneks know why. Mostoed, great with kipkap. And Cowboy of course, due to my American links with Harley. It was back in 2015 if I remember well. We went for a ride with friends and stopped to eat French fries at a fritkot with the Mayo. A good Belgian joke should be told with a brusseleir accent. Just stay in Belgium for a few months and you’ll soon understand why.